Article from CalMark Cover Co. Covering your Horse trailer, Truck and RV, maintains the value of your rig and saves you time in cleaning and maintenance before each adventure ! Choosing the right cover for your Horse trailer can be a daunting decision with so many to choose from on the internet ! Which fabric ? Custom cover or Universal fit ? Which price point ? Which company to work with ? What fabric is the best ? If your Horse Trailer is parked indoors when not in use, you can use a light weight non-woven fabric cover ,such as Tyvek, to keep the dust off. Light weight non-woven fabrics don’t have a long life span and break down quickly when exposed to many of the outdoor elements, especially from the sun & wind. If your Horse Trailer is parked outdoors when not in use, you will need your cover to be made from a heavier weight, durable acrylic woven fabric such as Sunbrella®. Woven acrylic fabric covers will have added strength and longevity to sustain long term outdoor exposure to the elements, especially the sun and wind. Sunbrella® fabric also offer the added benefits of being water resistant, mold and mildew resistant in addition to being the best in the industry for UV protection. A universal/one size fits many, cover, is great for a quick fix short term use cover. Universal sized covers will typically have loose extra fabric at some location on your rig that you will need to secure correctly so that it does not create a sail when its windy which will result in the cover tearing easily. Also be careful that the excess fabric does not provide areas for pockets of water to be trapped. 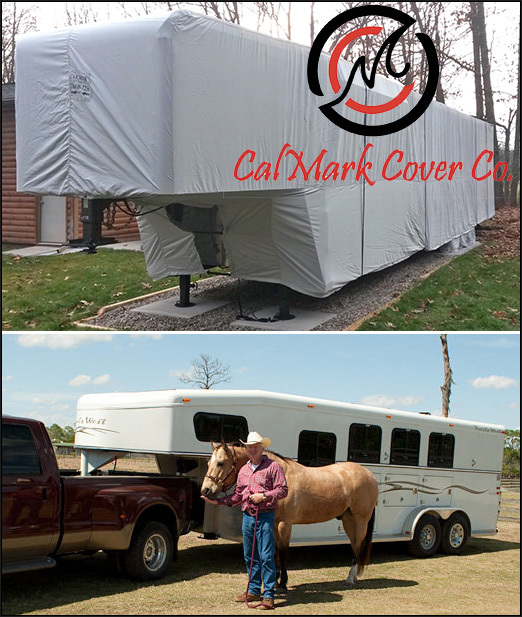 A custom fit cover will keep your Horse trailer or RV snugly covered and prevent it from blowing up like an air balloon when windy. A customized cover also minimizes the possibility of the cover tearing as there is little room for it to move when snugly secured. A custom fit cover also gives the maximum amount of protection agains dirt and dust being blown up under the cover, which means you have a cleaner rig when you uncover it and are READY TO GO. ! Deciding on how much to spend on a cover is not just about how much the cover price is… Every fabric cover offers a different level of protective care. Be sure that you chose a cover that maximizes the care you need from the environment that your Horse Trailer or RV will be stored. Don’t spend your valuable adventure time or delay the start to your vacation or Equestrian event with cleaning your rig before you go. Rather enjoy a cover that requires little to no dust off before your journey begins. Inquire about how many years the warranty covers and what the warranty limitations are. You may be paying more for a cheeper cover, quick fix purchase off the shelf that needs to be replaced every year, than purchasing a more expensive quality fabric cover that will last you several years of adventuring. So to summarize and address the final question: Choosing a company to work with is about getting the RIGHT cover for the type of coverage and results you need. Indoor/outdoor ? Choose a company that has the fabric & warranty that suits your climate and long term storage needs. Lightweight - non woven / Woven Acrylic ? Climate: Sun - UV concerns, wind, rain, dirt ? How much time do I want to spend cleaning your rig ? Choose a company that can customize your cover the way YOU NEED IT TO BE. !